A famous and leftist Turkish singer and writer Zülfü Livaneli has said the intellectuals in Turkey today are very much like the intellectuals of the Nazi Germany as they are forced to take side with the government, or else they face retribution in many forms. 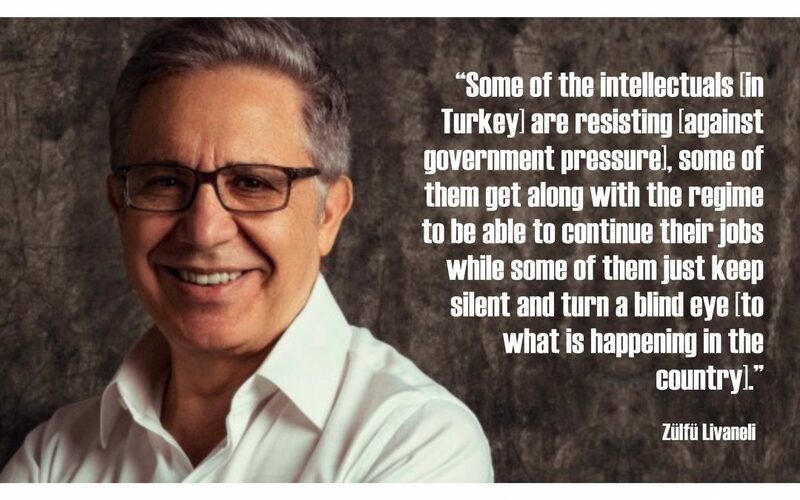 There are many intellectuals, journalists and academics in Turkey who face charges of insulting the president or government officials just because of their critical views. Dozens of intellectuals in the country have lost their jobs as academics or journalists while many of them have been jailed simply because they did not agree with government policies and publicly criticized them. When asked about Turkish authorities’ banning the banners of his latest novel titled, “Huzursuzluk” (Restlessness) due to a state of emergency in the country which was imposed in the aftermath of a coup attempt on July 15, Livaneli said the ban on the banners of his novel is not very important when Turkey is suffering from so many problems. “Yet, banning the banner of a book today means banning books tomorrow. By not allowing those banners, they [authorities] wanted to tell people that they are in peace [not restless]. It is very obvious where we are heading to step by step,” explained Livaneli.